The price of breakneck development? 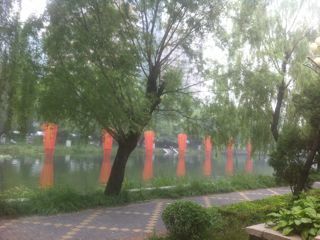 One of Beijing’s better maintained canals (near Dongzhimen) after the July flood – no damage here. The mayor and vice mayor of Beijing resigned this morning, after flooding caused by torrential rains killed 37 people in the city and its outskirts on July 21. Here is the People Daily’s report on it, carried by news portal Sina.com: Mayor Guo Jinlong and Vice Mayor Ji Lin resign(in Chinese). Rumors on the Chinese Internet today say the real death toll from the floods is much higher than the official count of 37. McClatchy Newspapers reporter Tom Lasseter filed an article, published in several American newspapers, about the death toll of the floods, and popular questioning of the government response to this and other disasters. The article covers a range of opinions, although most of them tend to back up the idea that the flood has decreased trust in the government; that includes me, I am quoted on the subject of the Internet adding to public misgivings about the leaders. I really don’t believe there are any new suspicions that have been caused by the deadly effects of the storm. Public cynicism is well entrenched. Although there are angry voices on the Internet complaining about the government’s handling of the flood and its causes, there seems — to me at least — to be much less anger at the government than there was last year after the Wenzhou high speed train crash, which had a similar death toll (around 40 in Wenzhou, depending on whose numbers you believe). One reason for the lower levels of outrage may be that the flood was caused by an observable natural phenomenon — anyone in Beijing on July 21 will have seen and probably been soaked by the torrential rains. There may have been underinvestment in rainwater drainage systems, but this is perhaps understandable in a city as dry as Beijing — sitting on the edge of northern deserts and with no river running through it. Personally, I don’t see how such disasters can be avoided if China’s continues it breakneck urban development. Beijing had a population of around ten million people and almost no private cars in 1990. There are now around twenty million people, maybe more, in the greater Beijing area, and they are all driving around on brand new roads, lined by brand new skyscrapers as well as shoddily constructed buildings that are just biding their time before demolition. Despite the economic gloom of the last two years, construction continues apace in Beijing. It’s just too fast for it all to be safe. This includes the sadly neglected system of canals and moats, some parts of which date back to the Yuan dynasty. Most of these canals are currently stinking creeks that do not appear to be integrated with the city’s rain water drainage system. Xinhua said it was embarrassing that many ancient drainage systems still worked and that cities had to rely on these “antiques” to resist the floods. In a royal palace near the capital’s Beihai Park, the roads were never submerged under waist-deep water thanks to drainage systems built in the Ming (1368-1644) and Qing (1644-1911) dynasties. Nine wells inside the palace collect the rain and link to an underground river which surrounds the palace and flows to the then city moat. In addition, the paving was laid in such a way that rainfall could easily find its way into the soil beneath, Xinhua said. Many other historic places, including Tian’anmen Square and the Temple of Heaven, have the similar system and weren’t submerged. 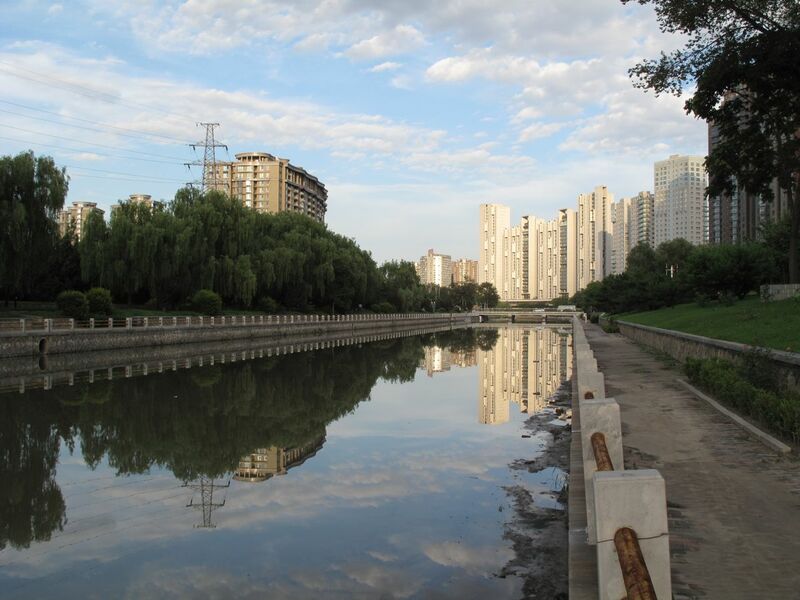 Below is a photo of one of Beijing’s old canals, the day after the storm. Note the complete lack of flood damage. A rain storm that lasted less than 24 hours killed 37 or more people in the capital of the world’s aspiring number one. That is not a good portent for what would happen if a serious earthquake struck the city. One wonders what plans the city fathers have for such an emergency. More on the flood and Chinese media reactions to it on Danwei: The Beijing deluge.